At the beginning of the trading week, Dow Jones index is trading near an important support level of 4/8 Murray or 24375.0. Geopolitical risks gradually recede into the background: Secretary of the Treasury Steven Mnuchin said that the administration of the US president is considering a trip to China to discuss trade duties and the opportunity to find a profitable solution for both countries. For the stock market, this event is positive. On the other hand, bond yields continue to increase and trade near an important 3% level, reflecting the participants' confidence in further tightening of monetary policy by the Fed, which, in turn, puts pressure on the stock market. Investors should focus on the preliminary estimate for the first quarter of this year; according to forecasts, an increase of 2% is expected. Also, the season of reporting of large American companies such as Facebook, Intel, and Microsoft, will continue. Stochastic is at 40 points and does not provide a clear signal for the opening of positions. 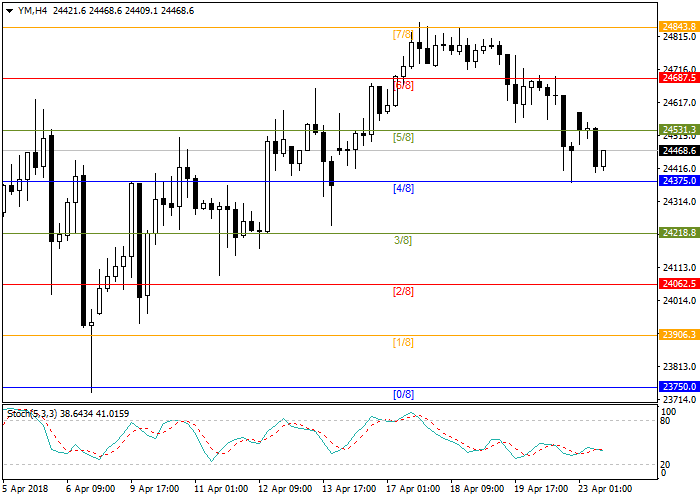 Long positions may be opened from the support level of 24375.0 with take-profit at 24531.3 and stop-loss at 24218.8.